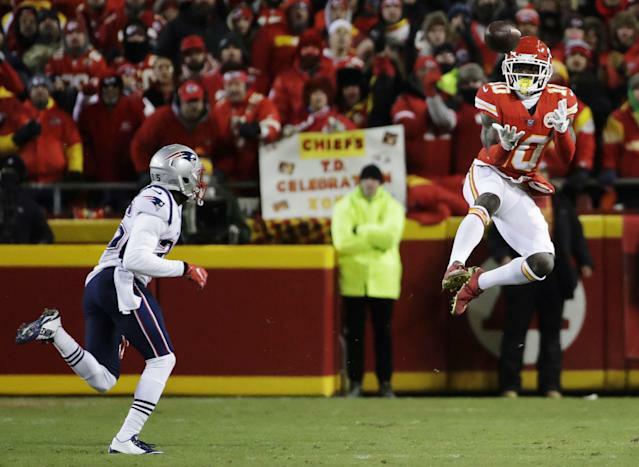 Kansas City Chiefs receiver Tyreek Hill reported for the start of offseason workouts. Police have been investigating an incident involving alleged battery of a juvenile at the home of Hill since early March. “He's here off of what we know. We're full steam ahead." The probe began when officers were called to the home of Hill and fiancee Crystal Espinal — who share the residence with their 3-year-old son — on March 14, according to a police report from the Overland Park Police Department that listed a juvenile as the alleged victim. On the report, Espinal was listed under "others involved,” while Hill’s name was absent. Officers were previously called to the same address to investigate a report of child abuse or neglect, but while Hill's name is listed on that report, the investigation for that one was subsequently closed three days later. The March 14 case was turned over to the DA’s office for review, and the communications director for the Kansas Department of Children and Families told Yahoo Sports that a report had been received and an investigation was ongoing.